Help out the Glenbow Town and Quarry Project by giving us more information about intriguing artifacts recovered from our past excavations. Put on your deerstalker hat and dig out your magnifying glass. Get sleuthing and dig up some clues on-line or in a book. You could win a great prize of Calgary Centre merchandise!! Identify the label or manufacturer of this glass bottle. 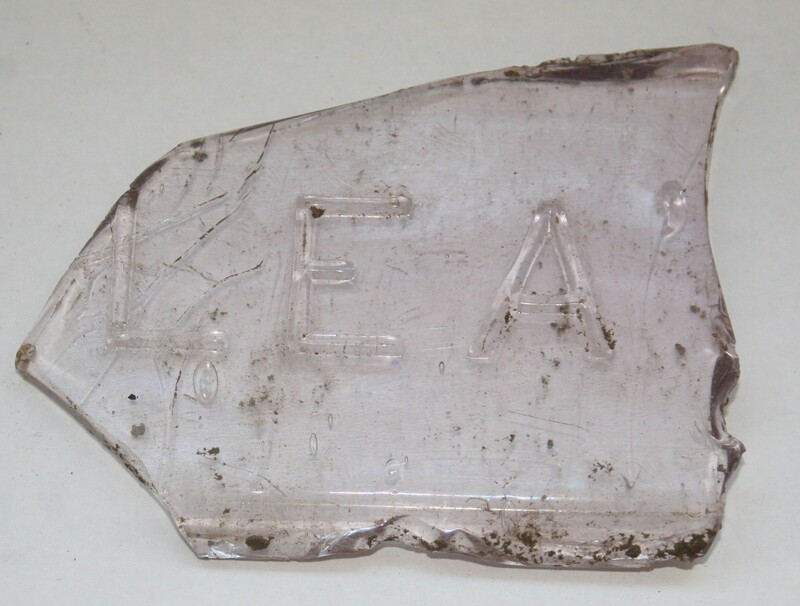 Clue: This clear glass bottle fragment bears the letters LEA followed by an apostrophe, therefore it is not a LEA AND PERRINS bottle. The surface is flat, indicating a rectan-gular, rather than cylindrical bottle. It is 8 cm (3 in) in length. To Enter: Submit your answer, with documentary support (no random guesses please), and your contact information to info@arkycalgary.com by June 30, 2017. Last Month’s Winner: Thank you to Deb deLooze for finding evidence for the Sham-rock Tobacco Tag suggesting it was produced by the Imperial Tobacco Company. Good Luck and may your investigation LEAd you to an answer! !